Golden Apples: Baa, baa Black Sheep, have you any wool? I don't know about the black sheep, but I have 4 bags full--and then some! These are the yarns for my upcoming socks in my self made sock club. 1 bag with 2 balls of Kroy Jacquard in Tangerine color way—a pastel orange with hints of pink—not quite coral, but a redish orange all the same. The pastels seem very summery. I have several sock that are autumnal—a few spring color ways are also needed. Close behind the bagged collection--the Roy G Biv socks. 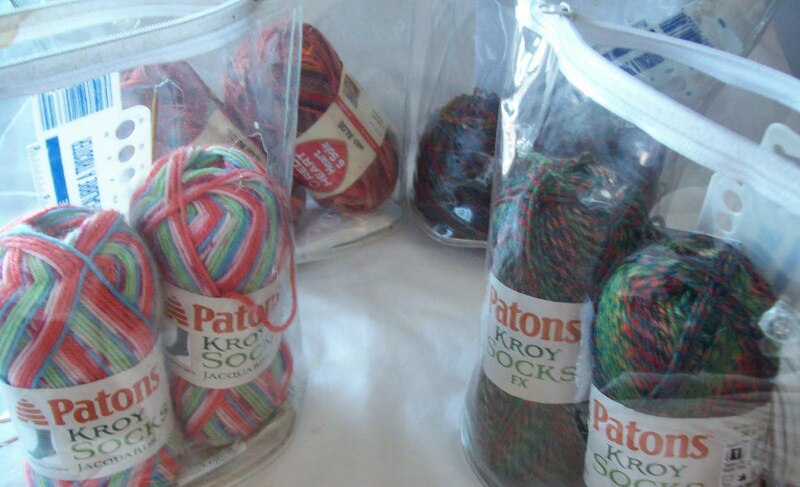 The yarns are assembled –(in a zip lock bag), but not yet divided. The background color still hasn't been finalized, though dark grey is in the lead. I think black won't offer enough contrast to the indigo or purple; while white will wash out the colors, and taupe (light taupe (aka oatmeal) and dark taupe (flax) have other (planned!) uses. Whether the colors will be knit as simple stripes or chevrons, or some sort of pattern –well there is time enough to make that decision. Crazy Eight socks are continuing to ferment--but almost don't count—since they will be knit from scraps, not stash. The zesty orange peko (bo) socks (5+ years old and never yet worn!) are very pretty. I really like the stitch pattern and effect--even if the sock themselves don't match anything. Maybe I need a citrus collection—with some lime green sock yarn (with other colors) becoming a lime rickie sock, and the yellow (more of the Kroy yellow) becoming a lemon fizz sock. The pattern for these socks is already documented. I want to see how the pattern looks worked in different yarns and color ways--and then maybe put it up for sale. Lion Brand is having a Socktacular, and has also just launched 7 new solid colors of Sock Ease. Just the thing! --I am, (roy g biv, not withstanding) short on solids in sock yarns. And I like every color. Smiley's is just about a neighborhood store for me. Not with in walking distance (thank the powers that be!) but close enough! I haven't been there in over a year—it's a dangerous store to go into—So much yarn, so little money needed to buy it –(over 90% of Smiley's yarns are $2.99 or less—and yes, half the store is synthetic (a complete color collection of Red Heart super saver) But the other half has some wonderful yarns—alpacas, silk blends, quality cottons, and 100% wools. Enough of a selection to make a yarn snob squeal. The worst of it is, I worked extra hours last week, and even with putting a bit aside for a rainy day, I have dollars that are crying out to become sock yarn. MONEY and SALES! A deadly combination if there ever was one! If I am really lucky, I will win one of the raffles at the Socktacular and have a free ball of yarn to work with—but I am not counting on it. 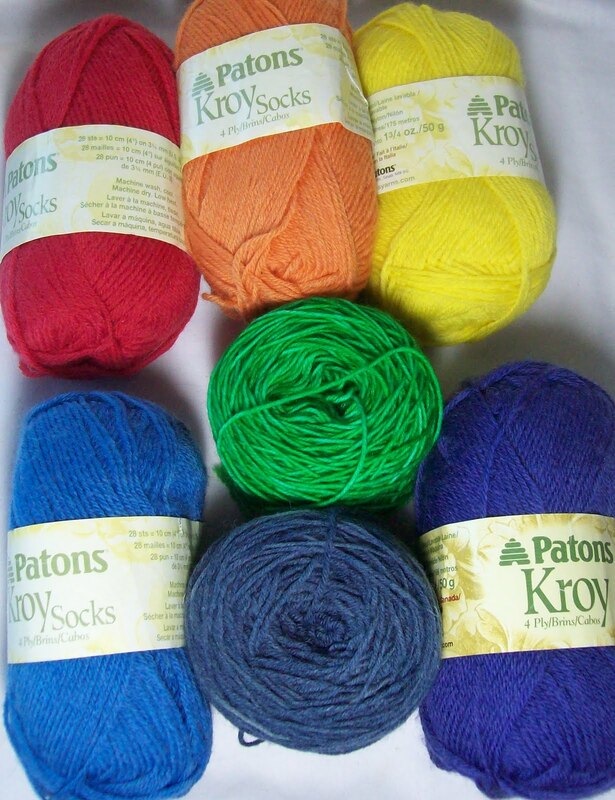 My current socks (on needles) are Kroy Stripes (mullberry color way) in my Cross Purposes pattern. They are chugging along. I started them late on the 15th—and they showing evidence of being finished by the 22nd. If I end up finishing them this weekend, I will still have a week and bit to get a third pair knit this month. A plain generic sock knit in a pretty self striping pattern will fit the bill nicely. Smiley's! I went there once, back when I lived in Little Neck, Queens. But it was when I was just getting back into knitting, and didn't knit enough to get too crazy. Unlike...now. I love the Roy G Biv collection you have there!